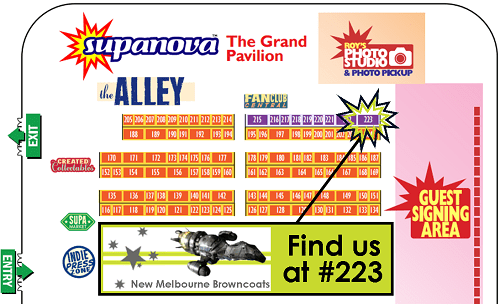 This weekend, you’ll find our Browncoat Booth at Supanova in the Melbourne Showgrounds Grand Pavilion (a change from past years where we’ve been in the Exhibitor’s Hall). We will have lots of shiny things for sale, and proceeds benefit two wonderful charities, Fitted for Work and FareShare. You’ll find us right by the Photo Studio and celebrity guests!